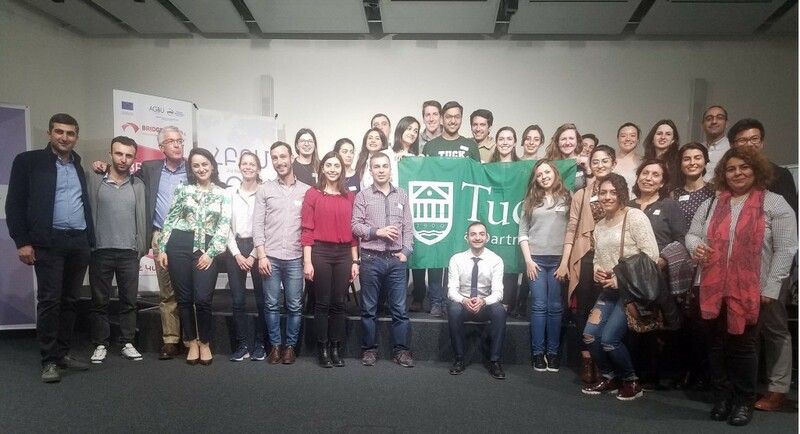 On March 20, AGBU Young Professionals (YP) Yerevan welcomed MBA students from Tuck School of Business at Dartmouth College. This is the 4th trip of Tuck students to Armenia. Visiting Armenia every spring with his students has become a beautiful tradition for Stephen Powell, professor of Business Administration at Tuck School. Being half Armenian, he is very enthusiastic about creating this link with Armenia for his students as part of the MBA program’s international module. The students get to explore local business and social enterprises, start-ups, community development initiatives, they visit cultural and educational institutions, government agencies, as well as travel to remote villages and connect with local population to experience the true national spirit. A highlight of such annual study trips, as the students mention, is the networking event with AGBU Young Professionals as it allows them to interact with local professionals with various backgrounds, exchange experience and share best practices. It is also very important for the students to make emotional connections with locals and build friendships. Such connections may lead to promising collaborations in the future. It is a great tradition to keep.